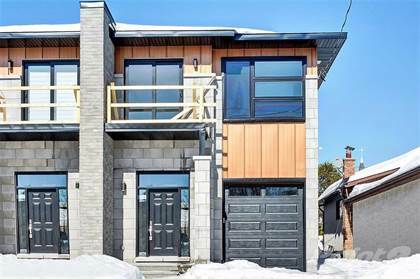 Fantastic luxurious semi-detached home in a prime location just minutes from downtown. A bright foyer is sure to impress a family & friend with 14' high ceilings. Sleek and modern open concept living room with a beautiful gas fireplace for you to enjoy. A gourmet kitchen is a chef's dream with high-end stainless steel appliances, quartz countertops, ample cupboard and counter space and a large centre island with seating - perfect for entertaining your guests. Spacious master suite features a walk-in closet, balcony and luxurious ensuite with separate glass shower, double sinks and lots of natural light. Truly a spa-like oasis. Secondary bedrooms are of a generous size. Lower level can be finished at the buyer's request for an additional cost. Photos provided are of a similar home. This home is under construction. Hi, I'd like to find out more information about 209 Columbus Avenue. Thanks so much!